This glamorous bouquet contains some of the finest varieties. We’ve chosen premium quality roses, exotic lilies, and a stunning mini cymbidium orchid as the highlights in this gift. With so much to enjoy, you are sure to be delighted with your choice. 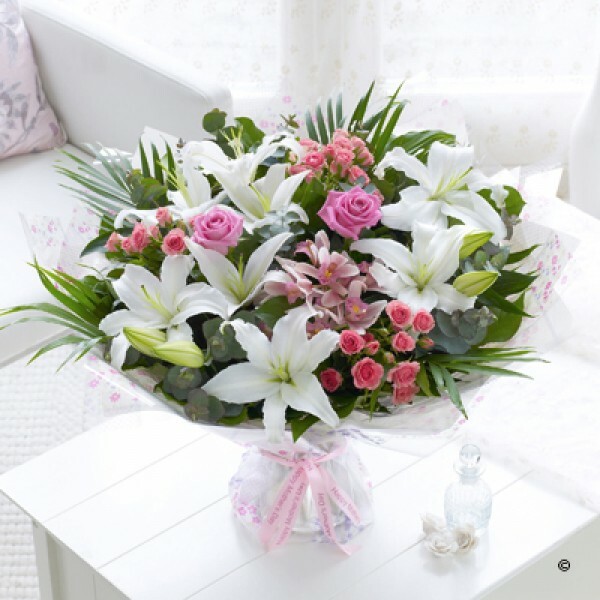 Featuring a pink mini cymbidium orchid, white Oriental lilies, pink spray roses and pink large-headed roses with palm, eucalyptus and salal, expertly hand-tied, gift-wrapped and finished with a ribbon.